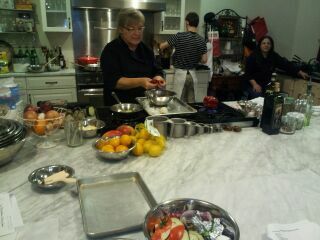 In the Kitchen Cooking School.....what a blast! 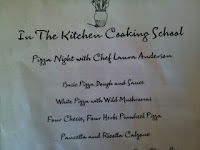 “Hey, you want to go to a cooking class Friday night?” After a 50 hour work week, Friday night is my worst night for doing anything other than dining out and heading home to curl up, so I hesitated, “Oh, come on, it’s a class on making pizza dough and great pizza”. Now I was intrigued. 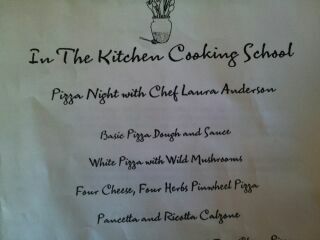 My husband’s new back yard pizza oven is almost ready to fire up and this class could be perfect timing. “And besides”, she added, “You get to bring your own wine to drink during the class”. I’m in. 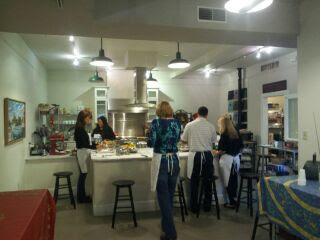 The “In The Kitchen Cooking School” is in Haddonfield, NJ and has a great concept. It is like culinary school – ala carte. Foodies, who work other jobs during the day, get to mingle amongst “their” people at night while learning great cooking skills and recipes. Courses range from basic knife skills; such as dicing (and trust me, you have been doing it wrong all these years), slicing, and the proper methods to chiffonade and julienne herbs and vegetables. And for the more advanced, courses, such as, An Evening in Paris featuring; Steak au Poivre, Salade de Poire; Asperges Roties; Mousse au Chocolat are offered to enhance your culinary knowledge. And unlike sitting in front of your TV watching the Food Network, here you are not just shown how to prepare every menu item – but you actually do all the work under the guidance of skilled, professional chefs. Best part? You then get to eat it all. The school website encourages you to “come hungry” and they weren’t kidding. There is much delicious food to consume along the way. Chef Laura roasting red peppers! Karen had seen an ad for a Friday Night Pizza Party that read “Pour the wine, crack open a beer and learn the art of stretching dough and make delicious toppings Pancetta and Ricotta Calzone; Roasted Eggplant, Red pepper and Feta cheese pizza; Pizza margarita topped with balsamic greens; White pizza with wild Mushrooms, Roasted garlic and Gorgonzola cheese”…and we were off! Most class sizes at ITK cooking school max out at 16. We were kind of lucky since one group who signed up for this course had to change nights at the last minute, so we had a small group of just five eager participants under the tutelage of Owner/Chef Kathy S. Gold and Chef Laura Anderson, who was leading us this night. Our group consisted of four women and one man who came straight from the golf course so hungry, he would have eaten raw dough if we had let him – sorry Jason. Since dough was the first part of the course, I was pleased to see that the almost- industrial size Kitchen Aid mixer that my husband bought me (see $450 Pizza in blog archives), was also the schools tool of choice. I thought I knew how to make basic pizza dough, but in just four easy steps, I learned some hints that make easy dough perfect or perfect dough easy (like adding the salt to the flour mix, not the yeast mixture). We were all assigned a recipe. I was making Roasted Eggplant, Red Pepper, and Feta Cheese Pizza, and Karen took White Pizza with Wild Mushrooms which was “money” (a term my son, an actual chef, uses when describing something out of this world good) . We all shared in the dicing, slicing and chiffonading of onions, garlic, eggplants, tomatoes and all kind of cheeses; feta, mozzarella, gorgonzola and Parmesan. We then staged them in the middle of the large Italian marble counter, so everyone could use what they needed. What amazed me about this class is that after only a few minutes the five of us were like old friends, cooking, laughing, and sharing stories (okay, maybe the wine helped a little here). Everyone encouraged the others because after all, we would all be sharing the results of everyone’s efforts. You couldn't help but keep an eye on what others were doing because each recipe was amazing. Simple to do and yet simply wonderful. One off my favorite recipes turned out to be the Pizza Margherta with Balsamic greens.This was a basic Margherita pizza, but the chef taught us to top it with arugula greens dressed in balsamic vinegar. Salad and pizza in every bite. It was amazingly good! Homemade pizza still on the peel! The recipe for my roasted eggplant and red pepper pizza looked harder to make then it actually was. I roasted the eggplant in the oven and the red peppers over an open flame. I sautéed garlic and crushed pepper flakes in olive oil and poured it over the cooked vegetables before adding the feta cheese and baking. I will definitely make this at home but thinking of using goat cheese instead of feta, only because it is a favorite of mine. There are so many different courses and recipes from around the world at the In The Kitchen Cooking School, that we are already planning our next visit. Owner Chef Kathy encourages, groups, families and friends to attend in unison, and will even accommodate request for specific menus. “Date Night Cooking” is very popular and usually sold out. In the end, I was so glad Karen forced me out of my Friday night coma to attend this class. We will return. Only this time we are bringing all of our friends for the perfect girl’s night out! Naples, Pirates and Hippies....oh my!! He calls me “mate” and I call him “captain”. He is three years old and I am not. 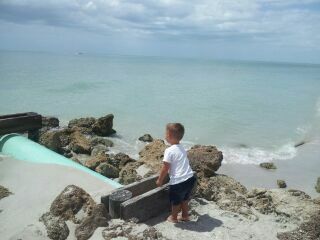 And yet recently, for several days in Naples, Florida, his imagination held me captive. He marches through his world carrying a plastic sword and a telescope, scouting for “the bad pirates”, and like a loyal mate, I followed behind him. The couch became our “safe ship”, where no one could hurt or attack us. Everyone should have such a place in their life. Off duty, his name is Drew and he calls me JoJo. He is the son of my niece, who, along with her husband, has recently moved to beautiful Naples, a well-to-do city on Florida’s Gulf coast where at a four-way stop, I encountered a Maserati, an Austin Healy and a Jaguar. I fortunately was driving a rented Lincoln SUV, so it looked like I fit it. (Although I may have been the only one with my mouth hanging open). This is where the wealthy snow birds, as Floridians love to call those northern pests that annually stoke the Florida economy, live and play for several months of the year. 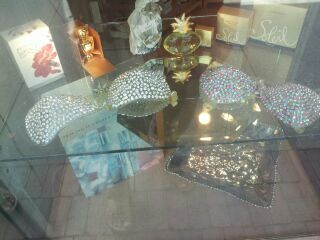 No....these are not bathing suit tops! Here, residents shop in furniture stores that have valet parking, and lingerie stores that sell jewel-studded bras (this one still has me baffled). Multi-million dollar homes line the palm covered coastline and life is good….if you’re into this kind of thing. And who wouldn’t be? Well….maybe me. I admittedly would love to have the “means” to live among the rich and botoxed beautiful, but it would have to be on my terms. Which, probably wouldn’t match the standards of those wearing Jimmy Choo sandals to the beach, so I would have to insist they lower them. Although, on one evening outing, I surprisingly discovered a group that definitely doesn’t fit the typical Naples profile, dancing on the beach as the sun was setting. After a lovely dinner out, the family decided to head to the coast to catch the sun setting over the Gulf. It was partly cloudy, which amazingly is what makes a spectacular sunset. And as we approached, we could hear tribal drums banging in the distance. After climbing the steps over the dunes, we saw a large gathering of what looked like the lost flower-powered children of the sixties, surrounded by torches, gyrating to the rhythm of the beat, wearing feathers, beads and tie-dyed shirts. There were hundreds of them swaying in the breeze and seemingly waving to the setting sun. They were generous in spirit and routinely motioned to the gathering of gawkers to join in and dance. 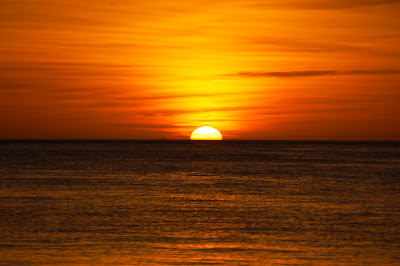 Upon questioning, I found that they meet every two weeks to honor and say good night to the fading sun. The drums get louder as the large orange glow drops beyond the horizon, and they raise their waving arms in unison until the last spark of light seemingly sinks into the water. The dancing continues as darkness sets in and the waft of….well, an illegal substance, lingers in the air. But it’s all good. I strangely sense a familiar connection with the people of my youth. In my head, I could hear Jim Morrison singing “Come on baby, light my fire”, and I am wearing huge bell bottom jeans and moccasins. I looked down and found Drew dancing while banging on one of the many drums dotting the sand. Even though he was wearing a Polo shirt and J Crew shorts, I thought to myself “ha, he is one of us,”! As the light disappeared, the crowed started to disperse and we walked the captain across the street for some ice cream. The juxtaposition (have been waiting to use that word since Journalism 101) of the Naples on the other side of the dunes and the Naples on the beach, amazed me. Within a few steps, we left the earth’s natural elements of wind, water, fire and free spirits, and stepped back into the land of luxury cars and lavish condos. Now, back home in my kitchen, sitting at my counter, drinking from my coffee cup, I’m feeling a little territorial as I reflect about lifestyles and Naples. It is beautiful and my niece and her family will thrive there. And with brothers, sister-in-laws, nieces, and nephews, I have much family in Florida now and will return as often as I can….but most likely never live there. I believe that seasons give texture to life and I need them to thrive in my own lifestyle. But being able to vacation in the south and live in the north is a bit like having the best of both worlds. And…..as long as there is a ship’s captain calling for his mate to help in his quest to rid the world of bad pirates, I will always be just a plane ride away. It is hard to be stunningly beautiful. I’m thinking, anyway. 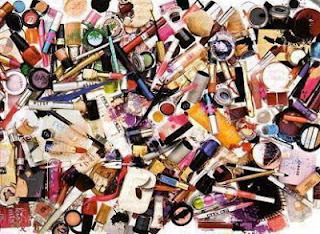 Sitting in my kitchen this morning looking at the sections of the Sunday paper that now come on Saturdays, I realize how many pages of the sale supplements from high-end department stores that are devoted to make-up. I actually started out looking for a quality dough hook for some planned homemade bread on this rainy, cool day, when the sheer quantity of pages containing very expensive cosmetics side-tracked me. I, admittedly, am not high maintenance when it comes to makeup, or even particularly skilled at the proper appliance methods. A few years ago, I discovered Cover Girl skin tone corrector, but until then, the facial application I bought with most regularity was Chap Stick. Last year, I bought a curler for my eyelashes that I have yet to use because it just looks painful. Now I, like you, know many women who if caught naked in the middle of the night with their house on fire, would be carried out by a fireman; bare-bottomed, clutching their makeup bags while applying mascara. These are the same women who tie up their bathrooms for hours getting things just right. I’m only in mine for the length of time it takes my husband to carry the groceries in. But today, for whatever reason, I decided to take a closer look at the many, many products that make the beautiful, stunning, and me – well, simply stunned. I learned that you start with a “fixing spray”, this helps hold makeup on, followed by a quality moisturizer that gives you a smooth surface with which to um…work on. Next is a primer that “makes pores disappear”, and then, a concealer. (This process, by the way, is eerily similar to steps taken to refinish an old dresser). Now, If my math is right, these four items total $185 (this week anyway), and you apply them before even getting to any of the makeup that is visible on your face! Here’s my problem; steps five and six are foundation and blush. In my makeup bag, these are items one and two and done! I am not even going to address the eyes! They have their own sales catalog, their own marketing department! From the stool at my kitchen island, I looked at my face in the toaster and thought ‘should I be doing more?’ Nah……. I decided to waste no more time and head head out shopping for my bread hook to get my yeast rising. Now, in our mall, the only way to get into Macy’s is through the makeup department. Spaced equally among the counters are very eager sales women (sometimes men) that look like they have spent years avoiding the sun, and have been trained to spot facial imperfections. Here, the well-dressed, perfectly coiffed customer gets greeted with a knowing smile that says “yes, we have that shade, do you need to replenish?” With me – they pounce. “Would you like a makeover?” or “Let us give some color to your face”. Usually I can make it through without responding, but today, after my morning cosmetic lesson, I felt armed with enough knowledge not to let their arrogance go unchallenged. “No thanks, ladies. You are looking at a middle aged woman (if I lived to be 112), in jeans, topsiders and sweater, who is very comfortable in her own skin. A little blush and mascara – I’m good to go. You both, on the other hand, could use a little color… so why don’t you put your employee discounts to work….and don’t forget the moisturizer, it gives you a smooth surface to work on.” When I finished shopping, I had to walk outside to get to my car in the cold rain to avoid going back through their department. There is more than one way to get color in your cheeks.